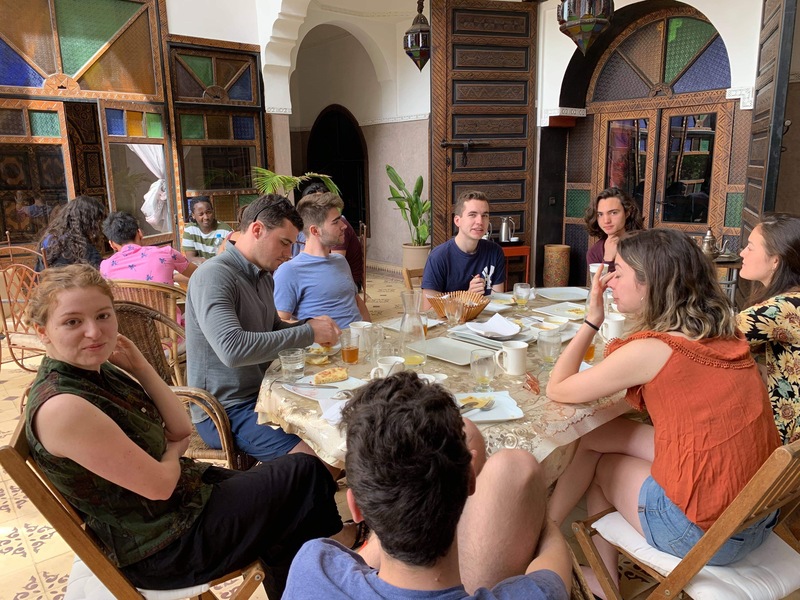 After a week of travelling, conducting interviews and practicing our foreign language skills, many of us found the opportunity to enjoy the warm Marrakech weather in our house and do work in the picturesque courtyard. Committed to our research, we used our free time to go over readings, transcribe interviews and write thank you emails to all the professionals, academics and activists who have spent time with us. Tired but grateful, we each decided to reflect on our experiences and share what we have learned with our fellow peers. As someone doing research on visual arts and cultural production, it was very useful for me to know more about Moroccan society and politics as it allowed me to understand many of the issues raised by contemporary Moroccan artists. Although it was a Sunday, we were still able to arrange interviews. Atrey spoke to Jawad Attac, who works for the Committee for the Abolition of illegitimate debt (CADTM), an international activist group that campaigns for the cancellation of debts in developing countries. Attac discussed the failure of Moroccan political parties in addressing labor rights. He was particularly critical of the left-leaning parties and their inability to support their base. He highlighted the influence of labor movements in the country, and how civil society has helped marginalized communities through grassroots campaigns. Attac also mentioned the pension protest and the boycotts of last year. In preparation for tomorrow, Aly and I stayed in the house to work on some questions for the staff at Le Jardin Secret, a 19th century Moroccan palace that displays many of the Mediterranean-Islamic artistic conventions unique to Maghrebi architecture. Additionally, we went over tomorrow’s agenda, which includes visits to the Yves Saint Laurent Museum and the Riad Yima, a gallery space owned by the celebrated Moroccan artist Hassan Hajjaj, in addition to our interview at Le Jardin. Overall, we spent our Sunday preparing for a hectic day coming ahead.